When will be Real Husbands of Hollywood next episode air date? Is Real Husbands of Hollywood renewed or cancelled? Where to countdown Real Husbands of Hollywood air dates? Is Real Husbands of Hollywood worth watching? Wouldn't you know, there aren't only "Real Housewives" parading around reality television. The BET original series Real Husbands of Hollywood evens the playing field somewhat -- well, not really. The program is actually the "fakest reality show ever," says BET, a satire that skewers all things "Housewives"-like. It stars Kevin Hart, Nick Cannon, Boris Kodjoe, Duane Martin, J.B. Smoove and Nelly, among others, while episodes feature guest appearances by television, film, music and sport's top stars including Jay Leno, Ed O'Neill, Shaquille O'Neal, Faizon Love, Common, Trey Songz and Cedric the Entertainer. The guys get nominated for Oscars for a slave movie and get caught up in the diversity controversy, Part 1 of 2. The guys get nominated for Oscars for a slave movie and get caught up in the diversity controversy, Part 2 of 2. 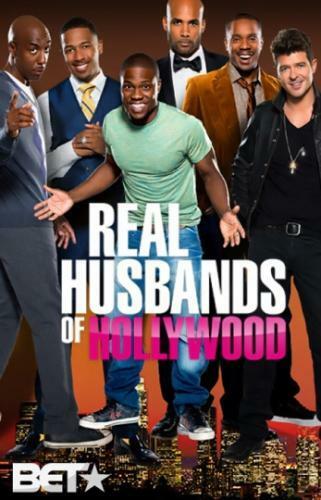 Real Husbands of Hollywood next episode air date provides TVMaze for you. EpisoDate.com is your TV show guide to Countdown Real Husbands of Hollywood Episode Air Dates and to stay in touch with Real Husbands of Hollywood next episode Air Date and your others favorite TV Shows. Add the shows you like to a "Watchlist" and let the site take it from there.